For saying that I spend a good proportion of my time in trainers, I thought it was about time to have a few as Shoe Of The Day. So for one week, trainers it is! To start us off, classics with a twist. 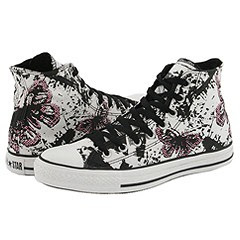 Converse Chuck Taylor Hi-tops are essential. Preferably in every colour known to man but especially red, pink and green. These are perfect for summer with a butterfly pattern (huzzah! more stuff with butterflies on for me to covet!) - they'd look suitably cool with shorts or a dress. Yep, I wear my Cons with dresses and I was doing it way before Lily Allen even thought of it! $47 from Zappos or around £40 in store at Office.